The prices listed are discounted for quantities of 10 items or more of each garment. Fabric suitable for medical facilities and commercial laundries. Our newly designed robe needs your name! You and your women's health center have an opportunity to choose this brand new design as your own. We will name the design after the nurse manager, ie: Joyce or Sue robe, or any woman's first name that is affiliated with your facility. An order of 250-300 robes would be acceptable to qualify. This outstanding design is both retro and modern all in one! The empire waistline accented with a sewn-on contrasting tie, along with the A-line skirt creates a slenderizing silhouette. A fold-back collar adds the crowning touch, as well as a real sense of style and privacy. Call for color and fabric options. Make it yours! Call us at 877-932-3726. It's not your traditional terry cloth robe. It is a velour terry cloth and has the WeberWear touch. Due to the fluxuating price for terry cloth, please call WeberWear at 1-877-932-3726 for an up-to-date price quote. Fabric suitable for medical facilities and commercial laundries. Truly a classic and one of our most popular robes. Our pique three-quarter length wrap robe is both economical and a comfort to wear. No more losing the ties on your robes. In this robe, the tie is sewn securely on the back in a rectangular pattern. Give your health center an attractive, distinctive look with these striking robes. Also available with side seam pockets, and/or upper front privacy panels. Create your own image by selecting the color of the robe and the coordinating color for the cuffs and neckband. This longer length Anne Robe is a full 45.5 inches from back of neck to hem. Additional inches may be added upon request. Seen here in pique fabric, but other fabrics can be used to create your own image. When you select this robe for your women, they will know you care. 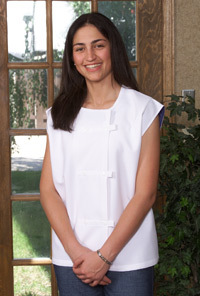 Pamper your women patients with our fabulous white pique robe. Designed with a classic front lapel and full raglan sleeves that taper slightly at the wrists. The fully encased back tie is sown in, but allows the robe to be femininely gathered at the waist. The luxurious pique fabric not only wears well but is able to be washed commercially in warm water and cool fast dry. The Double breasted wrap robe has delightfully long slenderizing lines and you can see immediately how special your women will feel when they "walk down your halls". The fabric is used by designers and provides that special chic look and feeling you want your women's health facility to portray. The front snaps allow for adjustment in width within each size. The Doleman sleeves fit all types of figures generously. This robe is listed as a "BEST BUY FOR THE MONEY" garment. Made from our well tested cotton blend pique, it comes in three colors: Sweet mint, ecru and white. All remain soft after many, many washings. The classic, simple lines of this front snap robe make it especially nice for womenï¿½s health. The sleeves and body are roomy enough to fit most everyone comfortably. The snaps keep the robe in place, providing privacy and dignity. The robe comes in pique. The Sue Robe is also available in a short hip length jacket. The Tonya robe is an exclusive design, just for you, and only for you. The robe creates a feeling of luxury and pampering through simple, high style and fabulous fabric. The robe's long, slenderizing silhouette will leave your patients with a sense of their dignity and your caring. The robe itself is belt-less with a gentle flow of fabric that builds to the hemline. The front invisible closure leaves only the long, straight lines for the eye to follow. The elegant pique fabric displays a clean and crisp picture. The contrasting colors in the collar and cuffs reflects the pure simple lines of this robe. Pique colors: white, creme, and mint. For a limited time, the Tonya Robe and Jacket will be available in Lavender Waffle Weave. Supplies limited call for details. The Oriental Jacket is reminiscent of the very popular Mandarin jackets that we see. The frog like closures on the front of the jacket add charm and grace. Our jacket is so popular that it is hard to tell it is a medical garment. When patients where this jacket they associate comfort and dignity with you facility. Made of a cotton blend pique, it is both luxurious and long wearing. The inside collar and cap sleeves are lined with the color of your choice to differential between sizes at a glance. The 100% safe plastic snaps are guaranteed for the life of the jacket. If you want to make a statement of elegance in your office you will want to select this gorgeous, long wearing silky exam top. It is made of 100% polyester. The boat neckline slides easily over the head. It snaps under each arm for privacy and dignity, allowing easy access for exams. Easy to launder, simply machine wash and dry (cool-warm heat). No ironing required. Price may vary with fabric choice. Call for sample. Picture not yet available. The cape is a complete circle which snaps down the front with a jewel neckline. Very effective for use with mammograms. Simply comfortable and wonderfully charming. This women's health jacket is a winner. You can snap the snaps in several different places, thereby allowing the jacket size to change to fit a variety of people. The plastic snap caps have several receiving beds to choose from. Allowing for different sizes in one jacket. The 100% plastic snaps do not show up on X-Ray. WeberWEAR will design garments to meet your specific needs. Each design is crafted with your input by an experienced Registered Nurse. Color, fabric, and price can be altered to meet your needs. Call for more details and a free estimate. To order call toll-free 1-877-932-3726. Prices listed are wholesale prices for 10 or more of the same color and same item number. Fabric suitable for medical facilities and commercial laundries.